The Valley East Today Weekly Online News Magazine is published and distributed every Tuesday to thousands of people, most of whom reside in Valley East, Capreol, and the Greater Sudbury Area. THIS IS A FREE PUBLICATION. Don Dicks, shown second from the right in the above photo, had no interest in ever taking up motorcycle riding at his age, but right after he retired from a 35 1/2 year career with INCO, he felt lucky. 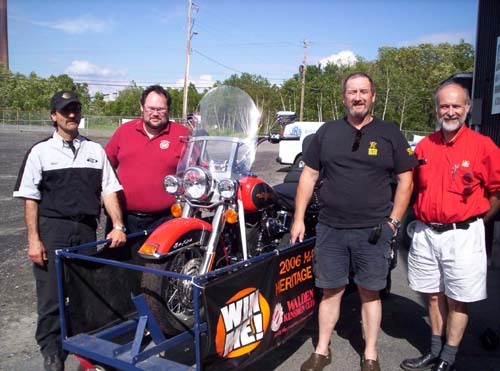 So, when he saw the Harley-Davidson in front of the Hanmer Home Hardware store at the Hanmer Valley Shopping Centre, he decided that he would purchase a $20 ticket to help out the Walden Kinsmen Club in their fund-raising venture. Imagine his surprise when he received a call on June 17, 2006 informing him that he was the new owner of a brand new 2006 Harley-Davidson FLSTCI Heritage Softail Classic bike worth over $29,000? Others in the photo include, from the left: Eric Kanerva from The Shop; Les Mayer from the Walden Kinsmen; Don Dicks; and Harry Sheppard from the Walden Kinsmen. Hanmer Home Hardware has consistently been one of the most popular spots for ticket sales for the Walden Kinsmen for the past couple of years. Mike Lemieux, owner of the store was pleased to see a local winner this year. Dicks, who now lives in Val Therese, started working on August 28, 1970 at the Copper Refinery. He recalls that it was right around the time of the famous "tornado" that hit the Lively and Copper Cliff area. On April 1 he began a well deserved retirement. "I only bought one ticket and never imagined winning. I've never won anything in my life, so this kind of thing just doesn't happen to me." Don is looking forward to riding horses more than motorcycles, so he is putting the bike up for sale in order to raise some money that can be used to purchase land outside Sudbury to raise his horses. He is asking $25,000 for the bike which is now being stored at the Shop in Walden. If you are interested in purchasing the bike, call Don at 969-6255. We know that through the power of the internet, the Valley East Today Online News Magazine is forwarded every week to individuals who are as far away as Florida, Vancouver and even Germany. I hope you enjoy the feature articles and stories that are highlighted in this edition encourage you to forward this newsletter to as many of your friends and acquaintances in your "address book" as possible. 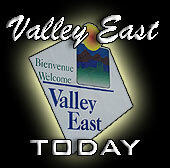 With your help we expect the Valley East Today Weekly Online News Magazine to reach over 20,000 people each week. Each week during the 2006 season, Brian Beaupre will be providing us with up-to-date standings from the Valley East Mens' Slo Pitch League. You will be able to open up the standings in a WORD DOCUMENT and save them to your own computer if you wish. We appreciate Brian's efforts in providing us with this important service. The Valley East Mixed Slo-Pitch League plays at the Centennial Arena Complex every Sunday afternoon beginning at 4:30 p.m. There are sixteen teams playing at both the recreation and competitive levels. Residents are invited to come out any Sunday and watch the action. New players are always welcome. If you want information about the league, contact the League President, Keith McLeod at 969-5063. The four people in the photo on the right grew up in Capreol and all attended elementary and secondary school in that town. 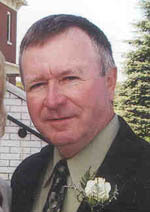 After that they all went their separate ways and didn't meet again until they were drawn to a very special celebration which was held at the North Bay Memorial Gardens on May 6, 2006. They were among the 350 couples who had gathered to celebrate 50 or more years of marriage. It was one of the largest gatherings of people to honour the sacrament of marriage every held in Canada. There were people from all religious denominations and from all locations. The happy people in the photo were, from the left: Terrance O'Connor and his wife Delores (nee Lamont), and Stan Martin & his wife, Verna (nee Sawyer). Terrance and Delores were married in 1952. They lived in Oshawa for 44 years and then have lived in North Bay for the past 10 years where Terrance is a Deacon at St. Rita's Parish. Terrance has just celebrated 30 years as a Deacon on June 5. They have ten (10) children, all married, 22 grandchildren, and 5 great grandchildren. Stan and Verna have been married 51 years and are currently residing in Capreol. They have 5 children, all married, and 13 grandchildren. A total of eight (8) couples from Capreol travelled to North Bay to attend the event, along with several others from Valley East and area. According to Verna, "Everyone who attended agreed it was very worthwhile and perhaps many more will attend if another event takes place next year. It was very emotional, especially when we all renewed our wedding vows in unison. It was a special event that we will always remember." Bob Rittenhouse, the pastor of the First Baptist Church spoke about the importance of marriage and what the lifelong commitment means. "Nothing is easier than saying words, like I love you. The hard thing is asking yourself do you meant them?" Bob Eubanks, host of the popular game show, the Newlywed Game, provided many moments of humour during his presentation. Organizer Tom Salidas, who sold the truck and trailer he won last year in the Big Brother's Dream Draw to help finance the event, is hoping to attract over 500 couples next summer. "If you have time to relax for a while, make sure you visit the following web site. It is one of the most amazing web sites you will ever come across." FANTASTIC FLOORS Introduces Quality ‘Roll Ends’ At The Best Prices In The City! 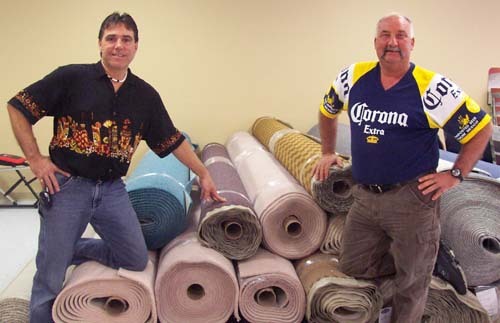 Ron Pedneault, owner of Fantastic Floors, located in the Valley Bingo Plaza in Val Caron, and his Sales Manager, Andy Szanto, are shown above examining a new shipment of “roll ends” that have just arrived at the store. Now that we have entered the spring season and people have been opening up their cottages, many of Ron’s customers have been asking him if he would search out “roll ends” that could be used for seasonal dwellings. The biggest challenge facing Ron and Andy was not in finding roll ends at low prices. There are plenty of roll ends available from manufacturers at bargain basement prices. However, the tremendous support Ron has experienced since opening on October 1, 2005 has been a direct result of his commitment to quality – not only in the level of service he provides to his customers, or in his guarantee lowest prices, but also in the quality of his products. It has been the mix of service, quality and prices that has quickly moved FANTASTIC FLOORS to the head of the class when it comes to the flooring business. After spending over 30 years working in the flooring business on everything from installing to sales and management, Ron has found that the transition to owning and operating his own store has been extremely satisfying. FANTASTIC FLOORS, is open Monday to Wednesday, from 9 a.m. to 6 p.m. ; open late until 9 p.m. on Thursdays and Fridays, and; open until 5 p.m. on Saturdays. We also invite you to visit our new web site which can be found at www.fantasticfloors.ca to take a virtual look at FANTASTIC FLOORS. 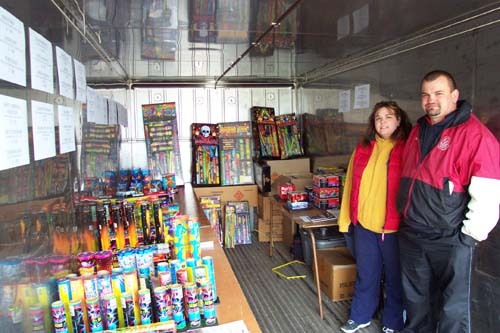 Manon and Scott Bolger stand inside the steel container at the Hanmer Valley Shopping Centre, looking over some of the fireworks that will be on sale by the Kin Club of Valley East in advance of the July 1 Canada Day. The Club will be at the Hanmer Valley Shopping Centre parking lot on Wednesday, June 28, Thursday, June 29 and Friday, June 30. Funds generated are then distributed by the Kin Club to local Food Banks and several other organizations in need of financial support. The Kin Club operates out of the playground building in Blezard Valley where it is open Monday to Wednesday from 6:30 to 8:30 during the summer months to provide refreshments to the minor baseball players. The club house is also open whenever weekend tournaments are held at the fields. Bob and Mary-Lou Bolger, have been involved in a variety of leadership positions with the local group for over 20 years. “Serving the community’s greatest needs” has been the motto for the Kin Club of Valley East, which has been quietly working to improve the quality of life for so many residents for so many years. If you are looking at purchasing fireworks for the July 1 holiday, give some thought to supporting the Kin Club of Valley East. The fireworks are less expensive than you will find most other places and all of the profits go directly back into the community. Anyone who knows Ron Masciangelo will not be surprised to discover who the driver is in this loader. When Ron is not selling cars, finding cars or driving around in one of his own classic cars, he can often be found enjoying time behind the wheel of one of his "big toys" to which it is often referred. 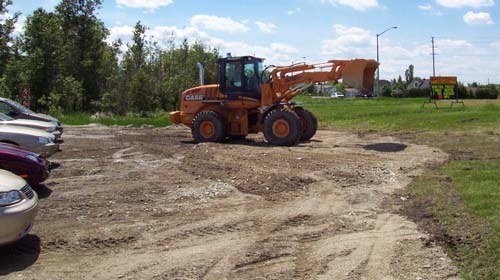 Here, Ron is leveling out some 60 loads of crushed gravel to expand and improve the looks of the Falconbridge location of Masciangelo Motors. The landscaping will allow him to bring in and showcase far more vehicles and will also add to the appearance of the lot which can be viewed by thousands of people each day as they drive past. When completed and everything is dried up properly, Masciangelo Motors will indeed offer customers the ultimate experience when it comes to finding a quality pre-owned vehicle that is just right for them. Ron Masciangelo is a familiar name in the car business around Greater Sudbury. This has been his career since 1974, and it has been his son, Jeff’s, since he was “old enough to wash cars”. 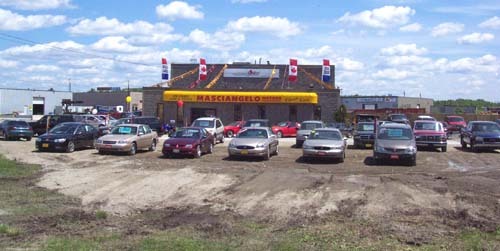 Masciangelo Motors was created in 1993 and since then this family run business has developed a solid reputation for selling quality pre-owned vehicles at an affordable price. The number of return customers is proof positive that people are satisfied with the products they purchase from Masciangelo Motors. Robert Kirwan has decided that the best way for him to make a difference in the community of Valley East is by being at the City Council table. The Marymount Academy Travelling Group is just one of the many groups and organizations that take advantage of an open invitation by the Hanmer Valley Shopping Centre to use its facilities to promote their activities and raise money through fund raisers such as car washes, penny tables, raffle sales and bake tables. There is absolutely no charge for the use of the facilities and the mall even provides tables, chairs and other material to help the groups. The owners of the mall, Val and Violet Mazzuca, have been strong supporters of Valley East and Capreol and will bend over backwards to help out in any way they can. If you or your group would like more information about using the mall, simply contact the Director of Marketing & Public Relations, Robert Kirwan at 524-7006. Re-Opens Friday, July 7, 2006 at 6 p.m. The Grotto of Our Lady of Lourdes wants to prepare an historical document for centennial year. We are inviting anyone with pictures and stories to tell to contact Josée Lapalme at 675-1151 ext. 5100. Come one and all! A fundraiser is being held by the youth group at The Grotto of Lourdes Shrine. Friday, August 11th, there will be a moonlight bowl at 9 p.m. at Plaza Bowl in Sudbury . Tickets are 10$ a person and prizes will be given throughout the evening. The youth are also challenging the adults to come out in great numbers. For more information or to purchase tickets, please call Christiane at 673-3961. It is sure to be a great time! The Michelle Tonner Ladies Golf Tournament in support of Easter Seals Kids will be held at the Clearview Golf Course on Thursday, July 20. Registration is from 11:00 a.m. to 12 noon. The tournament is a four ball scramble. Several interesting event sponsors have been arranged. There will be wine and chocolate tasting on some holes as well as mini-manicures on another. Each participant will be eligible to enter the draw for the door prize which is a golf getaway to Stonegate Inn in Orillia. There are two hole-in-one contests sponsored by Richard Tasse and Sears Travel. If you are interested in the tournament, contact Nicky at 566-8828 Ext. 4. The Valley East Today Weekly Online News Magazine and Community Web Site are being made available free of charge to local residents through the support provided by the following businesses and organizations. You are encouraged to take time to visit their web sites, which can be linked by clicking on each of the individual names listed below. On behalf of all who are enjoying the feature articles on this newsletter, we express our deepest gratitude to our sponsors.